Where does Alzheimer’s disease research stand? Dr. Keith Fargo, director of scientific programs and outreach for the Association, will update current research and clinical trials during a free and public discussion. During the time it takes you to read this sentence, someone in the United States will develop Alzheimer’s disease, joining 5.7 million other Americans living with this form of dementia. In 2018, this disease will cost the country $186 billion in Medicaid and Medicare payments. And right now, this disease cannot be prevented, slow or cured. But there is hope on the horizon. The Alzheimer’s Association is the largest nonprofit funder of Alzheimer’s disease research and is currently providing grants to more than 130 scientific investigations. 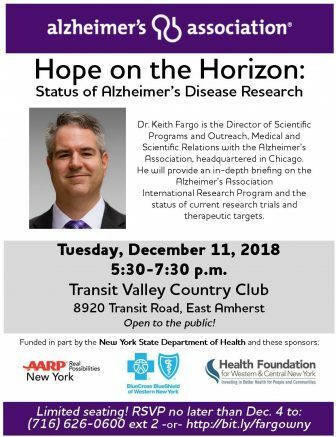 The status of those research efforts will be discussed during a special presentation organized by the Association’s Western New York Chapter at the Transit Valley Country Club (8920 Transit Road) in Amherst next month. Dr. Keith Fargo, director of scientific programs and outreach for the Association, will update current research and clinical trials during a free and public discussion on Tuesday, Dec. 11, from 5:30 to 7:30 p.m. Dr. Fargo oversees the TrialMatch program, which connects people living with Alzheimer’s and other dementias, their caregivers, friends and family, and others with clinical studies in their area. Additionally, he coordinates scientific programming for the Alzheimer’s Association International Conference, the world’s largest Alzheimer’s and dementia research forum, and he manages the publication of Alzheimer’s Disease Facts and Figures, a resource for U.S. data related to Alzheimer’s and other dementias. The program is funded in part by a grant from the New York State Department of Health and locally by AARP, BlueCross BlueShield of Western New York and the Health Foundation for Western and Central New York. Reservations are required for this free but limited-seating event by calling (716) 626-0600, ext. 2, or online at http://bit.ly/fargowny. Be the first to comment on "Where does Alzheimer’s disease research stand? "